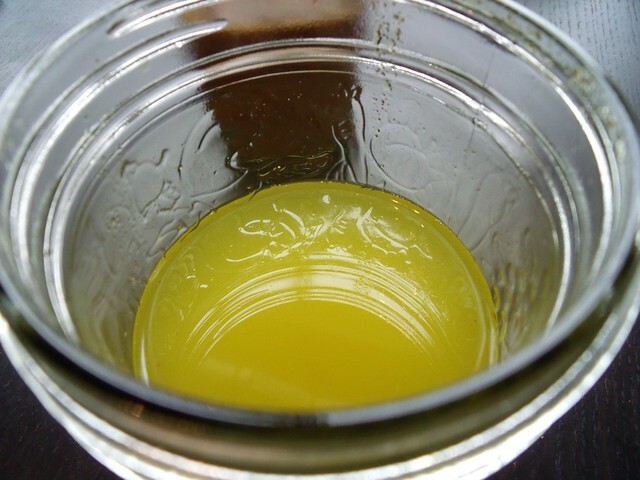 So if you’ve decided you want to master Ethiopian food like you’ve been eating in restaurants, you’d better start making yourself some spiced oil to cook with. And if you are doing it while you’re celebrating Vegan Mofo, you’d better figure out how to do it without butter. A great resource for vegan (and gluten-free!) 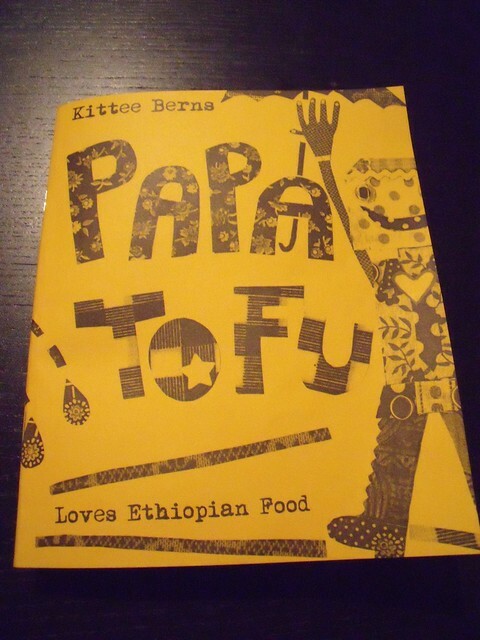 Ethiopian recipes is my new favourite cookbook (or rather, a “zine”): Papa Tofu Loves Ethiopian Food by Kittee Berns. Not only is Kittee’s tone and visual style utterly delightful, but her food is good. REALLY good. Really really really good. I’ve been reading this cookbook in bed since it arrived, drooling over ye’abesha gomen (mild collard greens) and ye’miser wat (spicy red lentils) and dreaming of making my own. And if you want photos of the tasty food people have cooked from her books, there’s a whole Flickr group for it. Warning: do not view if you’re hungry, it will be exquisite torture! 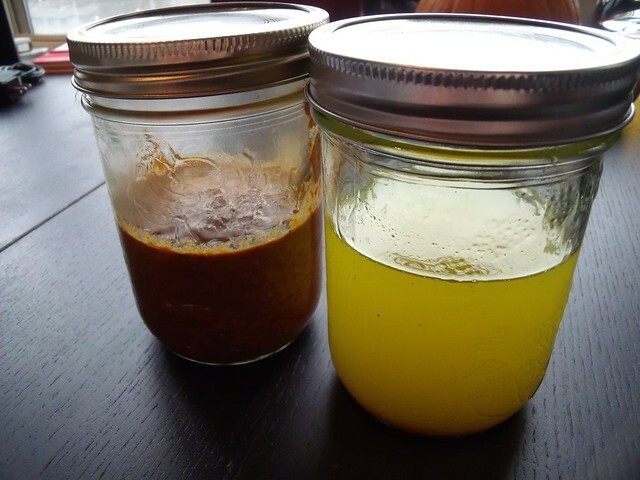 The place to start is with two basic ingredients: niter kibbeh (a spiced oil – the yellow jar on the right below) and berbere (a hot hot spice blend – the red jar on the left below). 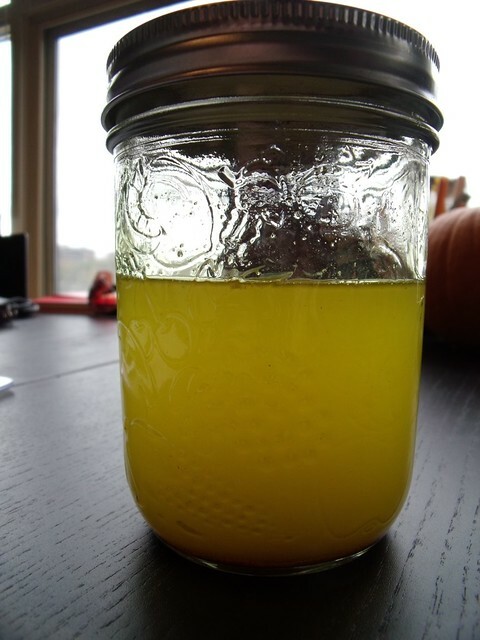 For my Niter Kibbeh I wanted to use an oil that was safe for high-temperature cooking (like for roasting veggies in the oven), so I went to my oil of choice: extra-virgin coconut oil. Yum. It makes tasty tasty Ethiopian food. To make your life easier, you can use a food processor to blitz the onion, garlic and ginger to get it to the right consistency. Or a good sharp knife will do the trick. 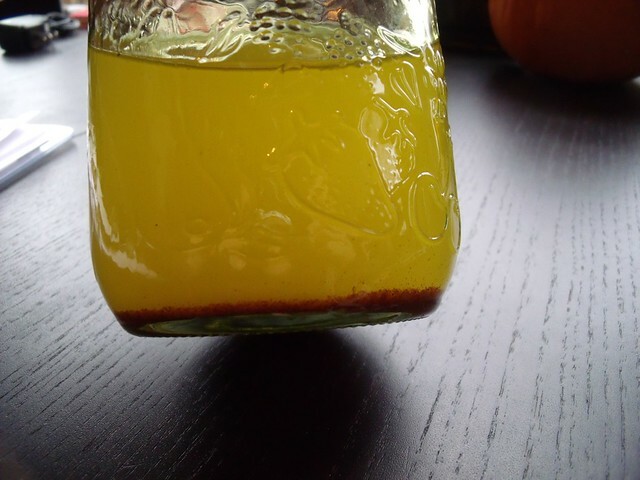 My whole place smelled decadent today — making this spiced oil makes such good smells. You need it too. And what do you need it for? Well, you can use it in place of oil in most of your cooking… or you can stay tuned for my upcoming Ethiopian dinner posts over the next few days. Yummmmm. Please note, Kittee has asked me to remove her recipes from my blog, and I am respectfully doing so. I adapted her niter kibbeh from Papa Tofu Loves Ethiopian Food. Lovely recipe! I am going to make this tomorrow. I am going to try it without the garlic and onion.